This part is an improvement of the pSB1C3 backbone. This improvement makes the backbone much more versatile by turning into a functional E. coli - Staphylococcus shuttle vector. 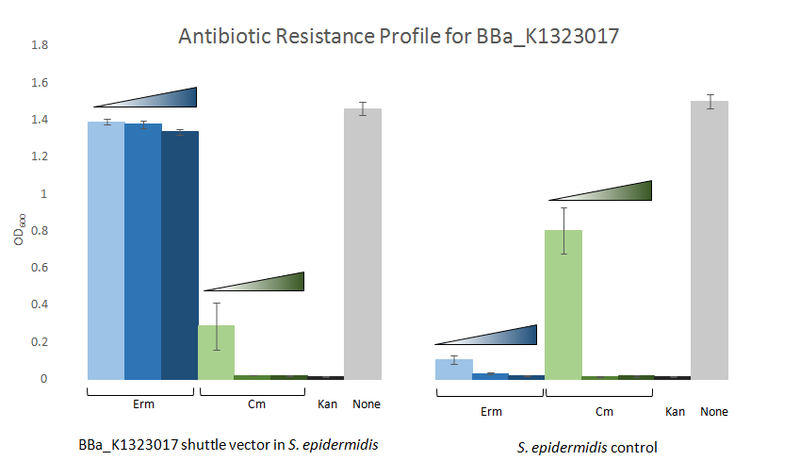 The Staphylococcus oriV from the pSK41 plasmid BBa_K1323018 and an erythromycin resistance gene BBa_K1323011 was inserted between the VR and rep (pMB1) regions in pSB1C3 using BamHI and BglII restriction sites. The part contains an RFP cassette BBa_J04450 between the prefix and suffix. The construct (pSB1CE3 shuttle vector) was electroporated into S.epidermidis. Three colonies were streak purified and diagnostic restriction digests were done to confirm that the insert was present. Overnight TSB cultures were supplemented with 10 µg/mL erythromycin, and the inoculation was done in triplicate. The negative control for this experiment was S.epidermidis (ATCC12228), it lacks erythromycin resistance but has chloramphenicol resistance. 10 µL of the overnight cultures were used to inoculate fresh TSB that was supplemented with 10, 50, or 100 µg/mL of erythromycin and chloramphenicol. The negative growth control was 75 µg/mL of kanamycin and the positive growth control was TSB without antibiotic. The samples were incubated at 37 ͒C, shaking at 200 rpm. The OD600 was read after 6 hours of incubation.